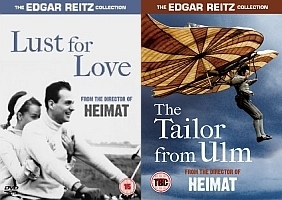 Renowned German director Edgar Reitz’s (Heimat) work is not to be taken lightly. Indeed if you are looking for light viewing then these two examples of his work (more are to be released soon) are probably not for you. If, however, you want thought provoking, exquisitely shot, award winning drama, then Lust for Love (1967) starring Heidi Stroh, and The Tailor from Ulm (1979) starring Tilo Puckner, might just be interesting enough to arouse your interest. Lust for Love, which won the Best First Work award for Reitz when it premiered at the 1967 Venice Film Festival, revolves around young photography student Elizabeth (Stroh), whose sole aim in life is the constant search for personal happiness no matter the cost to those around her. When she meets and falls in ‘lust‘ with trainee doctor Rolf (Georg Hauke), she pursues and ensnares him in marriage with devastating results. The Tailor from Ulm, Reitz’s most famous film, is an equally hard hitting tale. Based on the true story of Albrecht Berblinger (Puckner), a tailor who lived in Bavaria during the late eighteenth/early nineteenth centuries, it tells how the young man dreamt of flying after a bizarre encounter with a hot air balloon. Eventually succeeding, to a degree, the misadventures of Berblinger as beautifully brought to life by Reitz, are an inspiring tale of perseverance in the face of seemingly insurmountable odds, and proof that unwavering self-belief is essential to win any battle. When viewed together these two films share more in common than might first appear. Though set in different time periods and shot in different mediums, Lust for Love in stark black and white and The Tailor from Ulm in a vivid palette of rich hues, both stories central characters are basically romantic idealists, spending the duration of the films searching for personal fulfilment which they find in their own individual ways. Focusing on voyages of self-discovery, neither film was ever going to move above a steady amble. However, this is not really the point – you become immersed in their visuals just as much their narratives, with The Tailor from Ulm’s mesmerising attention to period detail and the monochrome visuals of Lust for Love being more than enough to hold your attention should the intense story-lines ever get too heavy.